my home is the local old volks home! i have, um, 9 or 10, without stopping to count them. seven of them are daily drivers, depending on my mood and what i'm doing. 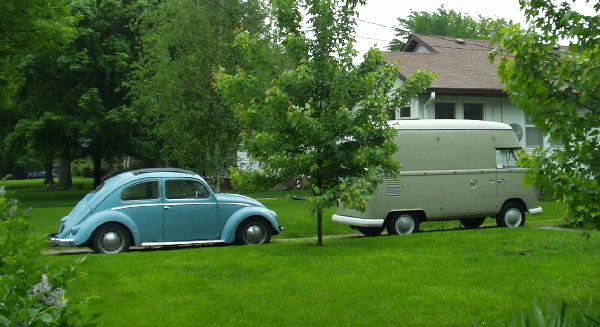 for driving, all i have are these old volkswagens; of course, i have about 30 bicycles, but THIS thread is about my cars. i'll just post a couple now, and will add as time permits. the local VW show is tomorrow, and the cyclo-cross [bicycle] race season starts tomorrow as well, so i have a full platter this weekend. the first vw is my latest toy. i co-own this with the woman who owns the coffee shop where i've worked the past [nearly] three years, after i quit practicing law full-time. it is a 1965 highroof panel van, quite a rare thing here in the states. these vehicles were never imported by VW to the states; this one came to california in 1969. it had been a moving van, and a camper. the most-recent prior owner just owned it [in vallejo, california] for eleven years, and drove it to shows, completely unrestored and slowly rotting away. we bought it in december, 2003, and had it restored in sacremento, california, from march, 2004 until its completion in april, 2005. i drove it the nearly 3000 kilometers from oakland to des moines trouble-free, its little 1500 cc single port engine purring up and down the mountain passes. i am experiencing difficulties with posting the photos, OF COURSE!! i'll post them later, after consulting my mentor, bobby. but because of my full weekend, and my need to get a ride in today, it will be saturday or sunday. sorry. but try this link to thesamba.com where you can see all the photos i have posted, including about ten of this highroof. hope this link is okay with the mods!! thanks for your interest, folks. enjoy the photos, and i'll get back to ya! Location: 18,000+ posts on TFP #1,2,3,4 and 5,but I'm not counting! I've seen a lot of veedubs but never one of those vans. Myself, I've got a '70 squareback in the process of coming back to life. Very very fun to drive if nothing else. Do not speak Latin in front of the books. RAGRBRAI! I love RABRAI. I did it 4 times in the 90s. Lots of fun. My parents have done it around 10 times. Anyway, back to your pics. That is a really cool van! Damn, I love the old vw's. I would like to get a beetle someday but they are sooo spendy now days, I think it would be an excellent product since they are so cheap to fix up. 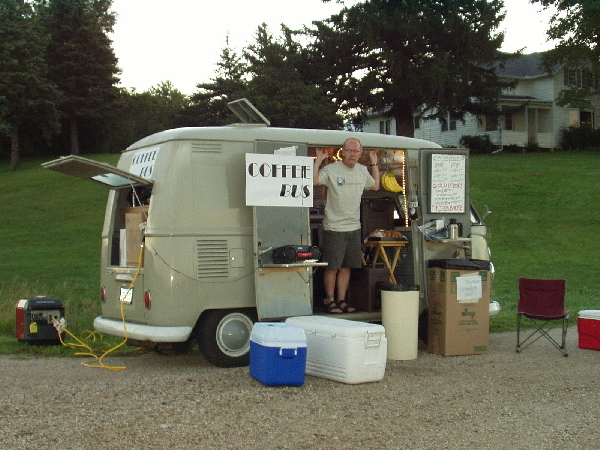 My parents did own a microbus but sold it to a guy for my motorcycle back in the day. Donate now! Ask me How! Please use the search function it is your friend. Look at my mustang please feel free to comment!